Looking for a welder for your home workshop? Whether you’re restoring your dream car or fabricating something completely different, a MIG welder can be an incredibly beneficial investment. The technology might date back to the 1940s, but it’s ideal for lower-power consumption needs, although there are plenty of high-power, commercial-grade MIG welders out there that you might want to consider. Of course, it can be challenging to find the right welder – you’ll need to compare them on a head-to-head basis, feature to feature, in order to make an informed purchase decision. We’ve done the legwork for you. Below, you’ll find a rundown of the 10 best MIG welders on the market for 2019, followed by an in-depth review for each model. We’ll even break down what you need to know about buying a MIG welder for your home workshop in our in-depth buying guide later on. 17 What Will You Be Welding? 22 What’s Included with the Welder? With our head-to-head comparison out of the way, it’s time to delve into the actual individual reviews to help you understand what each of these MIG welders brings to the table, and whether they’re a good fit for your particular needs. 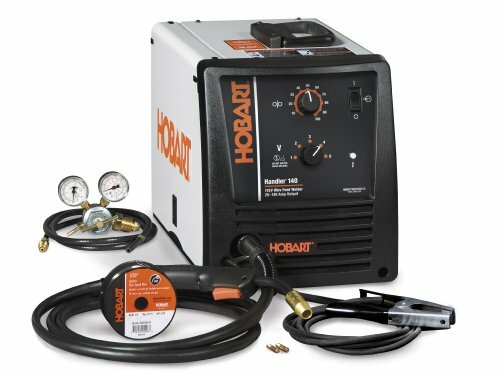 The Hobart 50059 Handler 140 MIG Welder is our top pick, and it earned that rank for quite a few reasons. While it might not be the most powerful welder on our list, or capable of welding the thickest metal with a single pass, it does offer some important benefits. One of those is the fact that it runs on household electrical current – it needs only 115 volts to do the job. It can also work with a very wide range of metals, including cast iron, mild steel, copper, brass, and even titanium and magnesium alloys. It’s the only one on our list to have those capabilities mentioned directly by the manufacturer, as well. It offers a 5-position voltage control selector so you can easily change metal thicknesses without creating a sputtering arc. The patented easy setup process ensures that you only need a few minutes to get things up and running. It also comes with a built-in gas valve, a 10-foot MIG gun with liner, a dual gauge regulator and gas hose, a 10-foot work cable and clamp, and more. The power cord also measures 10 feet, so you can easily reach projects outside the workshop. Note that this welder is MIG ready, with no additional components necessary. It’s also designed and built in the US, and comes with a limited warranty. 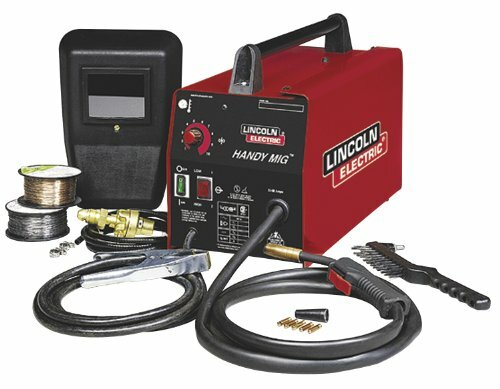 Compact and lightweight, the Lincoln Electric K2185-1 Handy MIG Welder is an excellent option for just about any home workshop. It is fully ready to go to work right out of the box, with no additional kit needed for MIG welding. It’s also rated for use with mild steel and cast iron, so it is the perfect option for work on automobile bodies, trailers, lawn mowers and other projects around the house. Note that this welder does fall slightly under the Hobart mentioned above in terms of reach – the power cord, MIG gun, gas hose and other components only reach about eight feet, rather than the longer 10 feet. This might not be a deal breaker, as it still allows you to use the welder virtually anywhere, with plenty of reach from the power outlet. Note that the manufacturer recommends this welder be placed on a circuit with a dedicated 20 amp breaker. It features four selectable voltage settings to ensure smooth changes while working. Note that this unit does not come with any shielding gas. You will need to purchase a cylinder separately. This unit is flux-core capable, and comes with all you need for flux-cored wire welding. 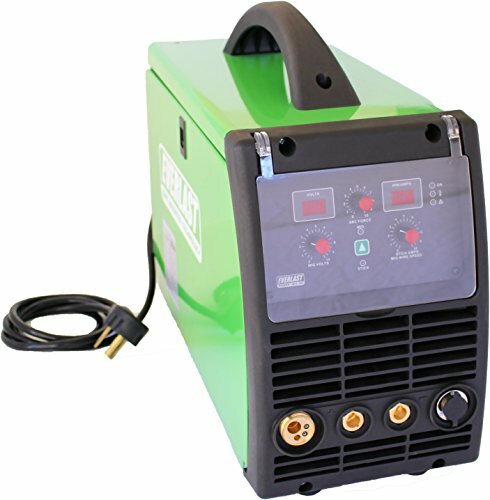 If you’re looking for a compact, easily portable MIG welder with decent capabilities, look no further. The Goplus MIG 130 Welder, or Wolf Welder, offers a lot of benefits. The body is made from stainless steel to ensure durability and a long use life. It also uses flux cored wire with self-released meetal0inert gas while welding to prevent oxidation. It’s capable of welding steel, as well as cast iron and other metals, and as such is a great choice for working on automobiles, lawn mowers, and similar projects around the house. Note that while the body is made from stainless steel, the handle is made from plastic. It’s thick, but it is not as durable as the rest of the body. The voltage selector offers four pre-set selections, and the body features dual air vents to keep it cooler during operation. It only needs 110 volts to operate, so you can plug it in and use it with virtually any home power outlet. However, note that the cords, hoses and cables only measure about six feet, which is shorter than the previous models on our list. This makes its reach a little more limited, but as the unit only weighs 35 pounds, you can easily combine it with an appropriately-rated extension cord to reach projects that won’t fit on your workbench. Another Hobart model to make our list, the Hobart Handler 210 MVP MIG Welder is a great choice for virtually any home workshop. Like our top-rated model, the 210 MVP offers a patented quick setup process to get you up and running quickly. It can also work with either 115 volts or 230 volts, making it pretty versatile. The gun packs 210 amps of power, and you’ll find that you can work with steel up to 3/8 of an inch thick. The unit also offers seven voltage settings and a convenient dial selector. The quick change drive roll technology means that you can easily replace wire rolls when they run out without the need for any tools. It’s also designed and manufactured in the US. However, this unit weighs in at a hefty 87 pounds, so while it is portable, it’s not all that practical to tote around. It’s better left in a dedicated position. The available rolling cart makes portability simpler, though, but it is sold separately. Note that this unit does not come with the SpoolRunner 100 spool gun – that is also sold separately. This unit does come with a 5/3/1 warranty from Hobart. 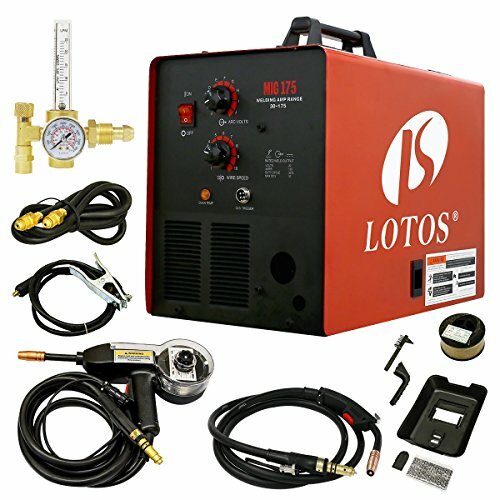 With 175 amps of welding output, the LOTOS MIG175 MIG Welder is a powerful machine that delivers professional results. It also offers the ability to weld both mild and stainless steel up to 1/4 inch thick, and aluminum up to 3/8 of an inch in thickness. It comes with a high-speed MIG spool gun that measures over 10 feet in length, and will work with either 4-inch or 6-inch wire spools (industrial grade). Note that this works with flux core as well. With the additional power output, you can tackle almost any job – from basic auto body work to lawn mower repair to stainless steel fabrication or repairs. However, there are a few drawbacks with this MIG welder. The most important one to understand is that it requires 220 volt power. If you already have a 200-volt outlet at your workbench or in the workshop, this is not a problem. However, if you don’t, then you’ll need to have it wired and add another breaker to your breaker box. The welder is also relatively hefty, weighing in around 80 pounds or so. Looking for an affordable welder that offers commercial-grade results, but in a form factor designed for a home workshop? 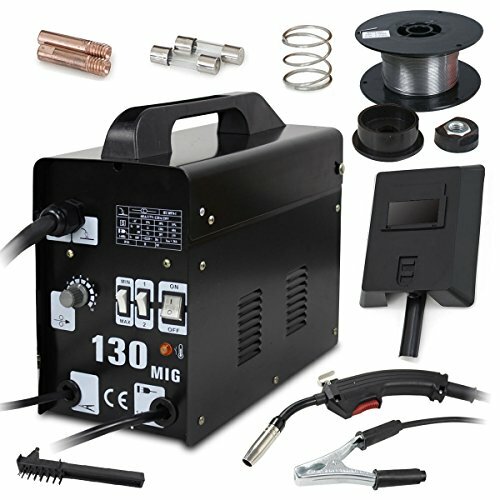 The Super Deal Black Commercial MIG 130 AC MIG Welder might be the right option. It offers 130 amps of power, so it’s not as strong as the LOTOS mentioned above, but strong enough for most of your household repairs and hobby work. It uses flux core wire, as well as being gas ready. One of the perks of this welder is its weight – it’s just 38 pounds, which means you can easily carry it wherever you need to go. The built-in handle helps with that. However, the handle is made from plastic and is susceptible to breaking. The body itself is made from thin sheet steel for durability and reduced weight. It only requires 110 volts of power, so it will plug into any regular outlet you have, and the selector switch allows you to change to any of the four operating modes easily. The welder also ships with a welding facemask for protection, as well as a spool of wire, a chipping hammer, wire brush and a ground cord. One of the most beneficial features of the Everlast MIG welder is the fact that it can operate on either 110 or 220 volts, meaning that it’s a great fit for pretty much any home workshop, whether you’re still using regular household power, or you’ve upgraded to a 220-volt system. This means that you have a great tool at your disposal, whether you’re fabricating a stainless steel water catchment system, or repairing a damaged mower deck. It also features a digital IGBT inverter to reduce weight and make the unit much more portable. This unit ships with a 10-foot MIG gun, as well as a work clamp and cable, spare consumable starter kit, and a Euro-style quick connector, which makes this unit compatible with a number of other MIG guns on the market if you decide you want to upgrade down the road. It also comes with the Ar/CO2 regulator. You will also appreciate the dual displays so you always have both the volt and amp readouts front and center, and the unit can operate in both MIG and stick mode. There’s a built-in burn back control that ensures the wire is always the perfect length for the next weld. The second entry on our list from Lincoln Electric, the PowerMIG 210 is a mid-weight MIG welder that offers some interesting benefits for a home workshop. Like the Everlast model above, this one works on both 110 and 220 volts, meaning that you can easily put it to work at home no matter what your setup might be like. It’s also relatively lightweight, weighing in at around 40 pounds, so portability is not a problem. The low profile handle ensures easy carrying without getting in the way, and the display is brightly colored and illuminated for easy visibility. This unit ships with a 10-foot MIG gun, as well as 10-foot cables with clamps, and a 10-foot power cord to help ensure that you can reach the best place to tackle your projects. However, note that this unit does require a spool gun, but it is not included (sold separately). 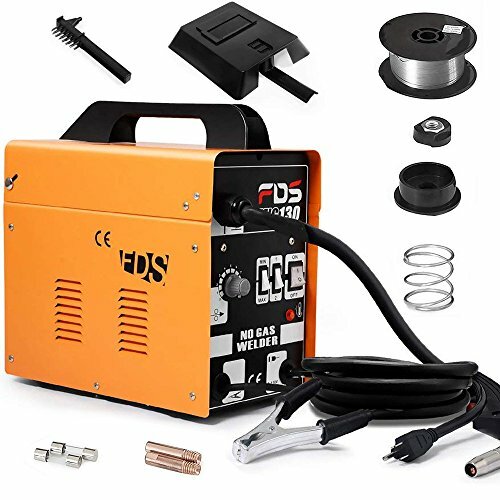 Note that in addition to MIG welding, this unit is also capable of using flux core wire, as well as DC stick welding to tackle heavy-duty jobs around your shop. Note that while most of the body is made from metal, there are several plastic facings that may be subject to breakage. Hobart makes their third entry on this list with the 500554001 Handler 190. This is one of the highest-powered options out there. However, it is only capable of running on 230 volts, meaning that it might not be the best fit for your home workshop. With that being said, if you’re purchasing for a commercial shop, or want to do commercial-grade work at home and are going to be upgrading your electrical system, this is a worthwhile investment. The Handler 190 offers 25 – 190 amp output, as well as seven operating modes with a convenient power dial and on off switch on the front. It can weld steel up to 5/16 of an inch in thickness, and offers a simple, easy setup process to get you up and running quickly. The kit includes a 10-foot MIG gun, as well as a dual gauge regulator and gas hose. You’ll also find 10-foot cables with clamps, and a 10-foot power cord so you can reach whatever you need to reach. Note that this welder comes with the SpoolRunner 100, which makes it capable of welding aluminum out of the box. 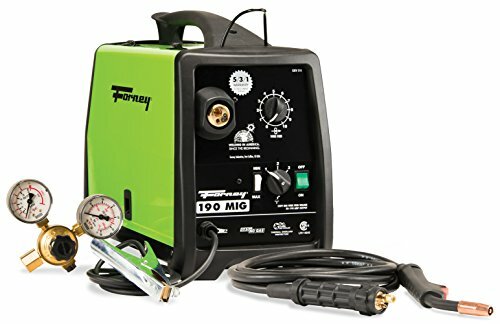 The final entry on our list is the Forney 318 190 amp MIG welder. It is capable of welding metals up to 3/8 of an inch thick in a single pass, and can operate in both MIG and flux core modes. The kit includes both the gas hose and the flowmeter you need, but it does not include the regulator, which is one reason it’s last on our list. The unit does feature a Euro-connect MIG gun, which makes it compatible with other MIG guns on the market. Unlike some of the options mentioned on our list, the Forney is only capable of operating with 230 volt power, so it may not be a good fit for a casual home workshop without an upgraded electrical system. With that being said, it does offer some interesting features, such as quick torch connect and spool gun capability. It also offers a full five/three/one year warranty similar to what you’ll find with Hobart products for protection and peace of mind. Note that this unit weighs 74 pounds, so while it is technically portable, you’ll want to invest in a rolling cart to spare your back. As you can see from our mig welder reviews above, there’s a MIG welder out there for just about anyone’s needs and requirements. Of course, if you have never welded before in your life, or never purchased your own welder before, it can be difficult to determine what your needs and requirements actually are. What should you look for in a decent MIG welder? What are the most important features and what can you live without? We’ll explore those topics and more in our buying guide below. 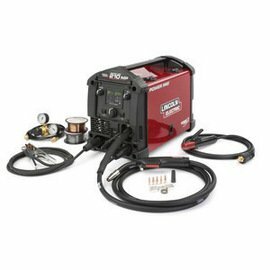 Whether you’re new to welding in general and want to be able to handle spot repairs at home, or you’ve welded before and are planning on opening a shop at your house, you’ll find that choosing the best MIG welder can be a bit challenging. There are plenty of models, and they all vary slightly from one another. Our buying guide will help you explore those options and understand what’s what. What Will You Be Welding? We’ll start our discussion with a question – what are you going to be welding? You’ll need very different capabilities for welding a rusted out lawn mower deck and building a custom livestock feeder out of stainless steel. So, someone with needs based on a hobby, or handling minor repairs around the home, will have very different needs than someone who will be producing professional work. A simple way to think about this is what you’ll be most likely to work on with your welder. If you’ll be doing general metal frame (auto, motorcycle, boat, etc.) work, you’ll need a machine capable of handling metals from 1/16 of an inch to 1/8 of an inch in thickness. If you’ll be doing heavier repairs, you might need a machine capable of handling 3/16 of an inch to 1/4 inch in thickness. Automotive body work will require a machine that can handle just 3/16 of an inch, while dealing with trailer frames will mean having a MIG welder capable of tackling metal from 1/4 inch to 5/16 of an inch in thickness. Structural welding will require a machine that can handle 3/8 inch thick metal and up. We also need to say a few words about your power situation. Most of the units on our list run on 110 volts, which is the standard household outlet power supply here in the US. 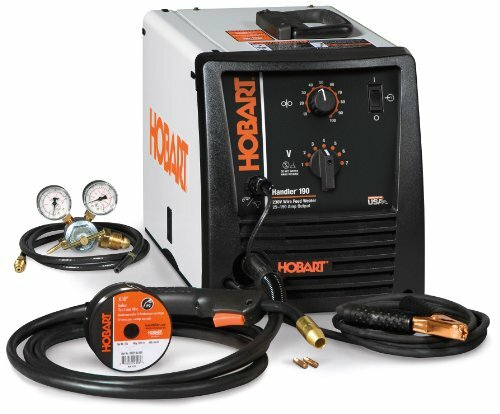 This is the best choice for anyone with a general need for a MIG welder, but who will not need higher-power outputs. 110-volt-welders are quite capable, but they do not reach the heats that higher-end welders can, meaning that they may not be the best solution if you need to deliver professional results. Some of the machines on our list can use both 110 and 220, and some are only capable of working with 220 volts. These are higher-end machines that put out a lot more power. Generally speaking, the more powerful the machine, the more expensive it will be. You will likely also incur additional expenses upgrading your power system in your workshop to 220 volts. The best advice here is that if you don’t need the extra capabilities, go with a 110-volt system to save some money. You’ll need to account for each of these things in your budget before you make your purchase. MIG welders can come in a couple of different configurations. They either work with argon gas, or they use flux core wire. Some of them do both. There are pros and cons to both types. For instance, flux core allows you to weld without the need for a cylinder, but it does create slag. You’ll need to chip that away and then smooth out the weld. Cylinder-based systems don’t create slag, but they’re more complex and have different maintenance requirements (gas refills). The better option might be to purchase a machine that offers both welding methods so that you can choose the appropriate type for your specific project. In a home workshop, it is unlikely that you will have a wide open service bay in which to work with your welder nearby. It’s more likely that you’ll handle smaller jobs inside, but have to go outside to work on larger ones. So, portability will matter a lot when buying a MIG welder. You’ll need to consider a few factors here. Weight: Ideally, you’ll have access to a lightweight welder. The heavier the welder, the less portable it will be, and the greater the need for additional accessories that will ultimately increase your costs – such as a rolling cart. Most of the welders on our list are relatively lightweight, but some of them are definitely on the heavier side. Handle: The handle provided is a crucial consideration for portability. Its height will determine whether you can carry it while wearing your welding gauntlets, or if you must remove them first. You’ll also need to consider the material of the handle. Most of the ones on our list are made from a plastic composite material to help reduce weight. However, this can become brittle over time and may crack or break. Cord Length: Welders have a number of cords and hoses, and you need to ensure that you have the length necessary to reach the project you’re working on. Most of the Hobart welders we touched on in our reviews came with 10-foot cords and hoses, but many others were shorter than this, some considerably so. Make sure that you know not only how long the cords/hoses are that come with the welder, but what you need at your workshop. What’s Included with the Welder? When buying a welding machine, you should receive more than just the welder itself. However, the actual items included with your purchase vary a lot from manufacturer to manufacturer and kit to kit. Below, we’ll run you through some of the things that are most frequently included, as well as a few “nice to have” items that you may ultimately need to purchase on your own. Gas Cylinder: If you will be welding with gas, as opposed to flux core, you’ll need a cylinder to attach to your welder. This should be included with the welder, but there are a few models on the market where this is not the case. Torch: Make sure that your unit comes with a torch. If it does not, strongly consider buying another unit; if you’re sold on that particular one, make sure you purchase a torch to go with it. Regulator: Most of the units we covered in our review come with the regulator you need to work with argon gas, but there were a few that did not. You also need to make sure that the regulator is argon/CO2 compatible (carbon dioxide is the most popular MIG welding gas, but argon is also used, particularly for titanium and magnesium). Welding Mask/Helmet: Welding can be quite dangerous, particularly for unshielded eyes. Make sure that the kit you purchase comes with a welding mask or helmet to protect your face and eyes from light and sparks. However, understand that most of the welding masks included are lower-end products. You may want to set aside additional money to buy an upgraded one with advanced features, such as auto darkening. We couldn’t provide a comprehensive guide without at least touching on duty cycle. This is a term that indicates the length of time you can weld at one go without letting the unit cool down. The longer the duty cycle, the more heat resistant the welder and equipment will be. However, longer duty cycles generally equate to higher prices, as well. You’ll find that most welder manufacturers list their duty cycle in the form of a percentage, and it indicates how much of a 10-minute period that you can actively work before the welder overheats and either shuts down on its own or suffers damage. So, if a unit had a 50% duty cycle, you would be able to weld for five minutes, and then let the unit cool for five minutes before beginning again. Finally, we need to touch on warranty. Many of the units we’ve discussed come with a 5/3/1 warranty. This means you get a five-year warranty on some portions, a three-year warranty on parts and labor, and a one-year warranty on other components. However, some manufacturers offer limited lifetime warranties, and yet others offer just a basic one-year warranty, or even no coverage at all. When everything is said and done, finding the right MIG welder for your needs is not all that difficult. Establish a budget based on your projected needs in terms of welding jobs and materials. Make sure you know what’s included with each welder, and that you’re able to purchase any necessary items that are not included. Finally, make sure you pay attention to portability, the length of the duty cycle, and the warranty provided on the unit. Dremel 3000 vs 4000: Which is Best?